Really lovely to touch, this highly polished, chunky bronze amulet, measures 27mm wide and 22mm tall. The leather thong is adjustable up to 30 inches. A bind run is a mixture of two or more runes. 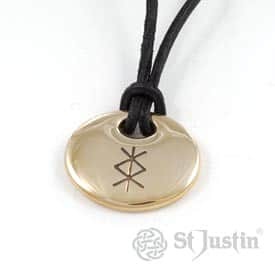 In this case the splayed hand of Algiz is warding off adverse force and combines with Sowulo the lifeforce, enabling the wearer to generate inner strength. Sold in a luxury St Justin gift box.